I am three weeks into my program and wondering, what the hell was I thinking? To make it easier for me and my fellow (under)graduate students, I’ve composed a list of 10 ways to ensure one doesn’t survive school. 1. Have kids. Lots of ’em. And, if possible, make sure you’re pregnant WITH kids. 2. Start out poor. Extra stress from financial burdens is extremely important to (non)success. 3. Stay home full-time with your kids, finding baby-sitters *only* when you have class. This way you and your children will experience (under)graduate school together! 4. Move FAR away from family. When you need help with little things, like an emergency baby-sitter, you will learn patience by taking your kids with you to appointments and classes! 5. Include your partner/spouse in the school/life/mother/spouse balance by sending them away for a few weeks. You’ll never appreciate them more than when they are gone and return. 6. Ensure that you live on the third floor of an apartment complex without a washer and dryer. This will make you appreciate your ancestors as you lug your kids (who refuse to walk), the laundry, the laundry supplies, and your pregnant body up and down the stairs to the laundromat. 7. Live in a *small* apartment. Nothing like enclosed spaces to improve familial relationships! 8. If you have a mental illness, don’t take your medicine – for physical or whatever reasons – to improve your chances at (non)success. 9. Ensure that your toddler and preschooler are sufficiently independent and busy enough to cause all types of chaos while you attempt to work on a paper. 10. Don’t sleep. Blame it on pregnancy-induced insomnia, anxiety-induced insomnia, or just insomnia in general. That way, by the end of the week, you are hysterical with overwhelming stress and exhaustion. A perfect recipe for (non)success. If you can, try to combine one or more of these and I promise you the (under)graduate experience of your life! When I had Andrew, something happened. I was tired, I was lonely, I was stressed, and I was overwhelmed. Ben was working, attending school, studying for the MCAT, and trying his best to be there for me and the kids. My little boy was fussy, very fussy. He cried and cried, I cried and cried, Emily cried and cried. I pushed joy away so I could have room for misery. Emily was growing, maturing, turning into a toddler. I wasn’t ready. I wanted her to help me, but I didn’t want her to be adventurous or seek autonomy. I wanted–I needed–her to sit down next to me, playing quietly. Not running from mess to mess, taking advantage of me nursing to get into everything. I found myself turning into an awful mother. I went from using calm tones to relying on harsh tones; being happy and engaging to being angry and distant; patient to impatient. My husband’s busyness and my loneliness excused me from improving my behaviors. Until one day I really looked at my daughter. What I saw was not a little monster trying to ruin my life, but a little girl, a toddler, who was discovering her little world, begging for me to help her. How I viewed motherhood changed. In The Family: A Proclamation to the World, the leaders of my church remind mothers (and fathers) that we are to nurture our children. I do feed and protect my children every day, but do I support and encourage? 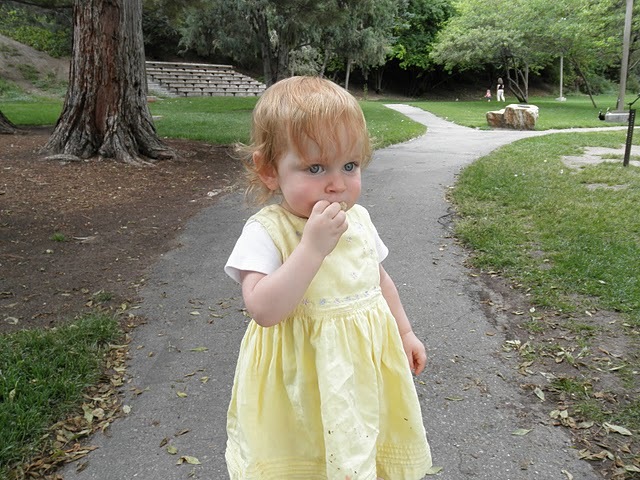 More importantly, do I support and encourage my toddler as she discovers her world? I knew what I could do to temper her melt downs or aide in her autonomy seeking behavior. That is what my degree is in. Yet I was neglectful and I took the easy way out. I have had several impressions reminding me to use my education to help me parent. I ignored them. Silly, really, considering I am often moaning to Ben that I can’t use my degree. I am thankful that God is patient with me. I can change and I will change. These changes will not happen immediately, it will take time for me adjust my behaviors. I feel powerful, I know that I can do this. How have you grown/changed as a parent? 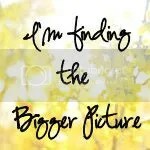 This post is (now) part of “I’m Finding the Bigger Picture” event. Click on over to see more events!